We arrived back home last Friday and are just about settled in. As to our Egypt trip it was like a dream come true. This is going to be a long mail so grab a drink and settle down before you start reading. Waleed is great facilitator and the guide he had chosen – Eslam was really out of this world. He was young but extremely knowledgeable and passionate about Egypt. He was not like guest of our family but our family for the 4 days we were with him. It might read like an itinerary but I would like to call it a travelogue. Waleed picked us up from the airport and onto the hotel on Thursday. Had lunch and Waleed had introduced us to the Captain of the Felucca on which we spent a magical 2 hours during sunset. Went across to the Philae Temple sound and Light show in the evening. Next day morning (Friday) Waleed came over and introduced us to Eslam our guide and left us with him. We went across to the Unfinished Obelisk, the Philae Temple and the High Dam and later onto the Cruise boat. Nile Shams. The boat was nice and comfortable with a full length sliding window. Good food too. Waleed wanted to know how Eslam was and we gave him a thumbs up. We asked Waleed if Eslam would be our guide in Luxor too and he answered in the affirmative provided we were happy with him which we were. We set sail and reached Edfu that evening. Kom Ombo was not open due to some demonstrations and we could not go there which was a bit of a disappointment. Eslam was waiting for us at Edfu on Saturday Morning at 7.30 AM and we took a caleche to and from the Edfu Temple and back to the boat to sail to Luxor via the Esna Lock. Fortunately Eslam also got onto the boat with us when we returned from Edfu. We reached Luxor by about 5PM and as we were free doing nothing checked with Esalm if we could do the Karnak Temple Sound and Light Show that evening instead of the next evening and he was most willing and also happy. He set up everything - Van, Driver etc in a very short while and we were able to go across for the Sound and Light show at Karnak Temple. On the way back to the boat we stopped off at supermarket and then to KFC for a take away and went back to the boat by around 10.30. That everybody was so accommodating for even small things was what was most appreciated by us. Sunday morning Checked out of the boat with luggage in the Van and off to Colossi of Memon, Deir el-Bahari, Valley of the Kings (Including the tomb of Tutankhamen) and Valley of the Queens and Medinat Habu. Awesome!! We wanted a small rest but were free in the evening so asked Eslam for suggestions and he suggested we go across to the Luxor Temple in the evening which would be illuminated. We agreed and it was a great decision. The temple all lit up was magnificent. We strolled across to the Luxor Souk afterwards to shop for some trinkets and a book shop to pick up some books about the Valley of the Kings as well as a DVD titled KEMET. Next day we had only the Karnak temple to visit which we finished off pretty early in the morning and the Itinerary as discussed with you was over with a day to spare. So we again turned to Eslam. After little discussion with Eslam we decided to do the Tombs of the Nobles and later that evening, go over to the Luxor Museum. Aren’t we glad that we did the tombs of the Nobles. Some of them were in much better condition than those in the Valley of the Kings and the Queens - very colourful and extremely well preserved. We make it a point to eat the food of the locals whenever we travel and that was what we were doing on the entire trip rather than eat at the hotel except for breakfast out of necessity and my daughter asked Eslam if there was a Shawarma place on the way back to hotel in the afternoon and after consulting with the driver took us to the place a little distance from our Hotel. Both Eslam and the Driver were glad to go a little bit out of the way for us and these small things made us feel really nice. We went across to the Luxor Museum by around 5.15Pm but were surprised to find it closed. They had recently decided to close the museum early on a temporary basis on instructions from Cairo. This was the only glitch in our entire Itinerary. Eslam was feeling really bad and apologised numerous times and we had to keep insisting that it was not his fault and he could not be responsible for the museum being closed. Eslam left the same evening back to Aswan and we all were missing him as he had become part of our family during the very short time we were together. On a lighter note - when we first met he could not pronounce my name and asked me if he could call me Carter after Howard Carter I presume and that’s what he referred to me the entire time he was with us – Mr. Carter!! The next day morning the van was there waiting to drop us to the Luxor Airport and so ended one of the best holidays me and my family have had. We flew to Dubai and spent a few days there as well as Abu Dubai before returning home. Dearest Petra don’t be under the impression that I am singing praises only of Eslam. 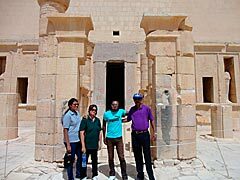 Waleed was in constant touch with Eslam, the tour van driver as well as the tour company in Luxor and the Cruise boat. I was very much aware of his frequent interactions (at least 4 or 5 times a day) with Eslam as well as the Driver and tour Company as I was able to pick up bits and pieces of their conversation in Arabic. He was behind the scenes orchestrating everything so that we would have a great time. He was and is the star behind the scenes and responsible for our having a great time. Last but not the least - nothing of the above would have been possible without you my dear Petra. You are in reality the unseen heroine who we did not have a chance to meet. One unrelated thing is that we also found a great knowledgeable guide and a very nice person in Cairo so that leg of our trip also went off very well. We came to Egypt as travellers or tourists but left Egypt as if we were leaving our own country. - and very important to me - how was Aswan Individual? The answer My dear Petra to the above question is in all the lines above so I will not repeat myself. Yes it exceeded our expectations. Is there something you would like to tell me to change for future guests? If there is anything we can think of I will certainly let you know. Would you recommend Aswan Individual with a full heart? In the next couple of days I shall post a concise version of the above on Trip Advisor. 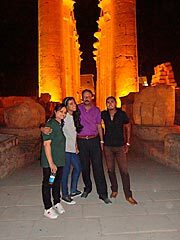 Me and my family thank you and Waleed with all our hearts for the excellent holiday experience we had in Egypt. I will mail Waleed or call him in the next couple of days but request you to convey a gist of the above to him. Warmest Regards Dearest Petra and all the best to you and your family. thank you for the time you took to write such a beautiful review and the photos. I made them small, so the faces cannot be tagged. Thank you also for your very nice review on tripadvisor on June 4. Thank you for becoming friends staying in touch.